Meet the pets who brighten our days and make the treehouse life even sweeter. Whether they're snoozing on sawdust in our prefab shop or slinking through the trees at Treehouse Resort and Spa, these pets always bring a smile to our faces. We couldn't do the work we do without them! OK, so sometimes these pets also cause a bit of chaos. 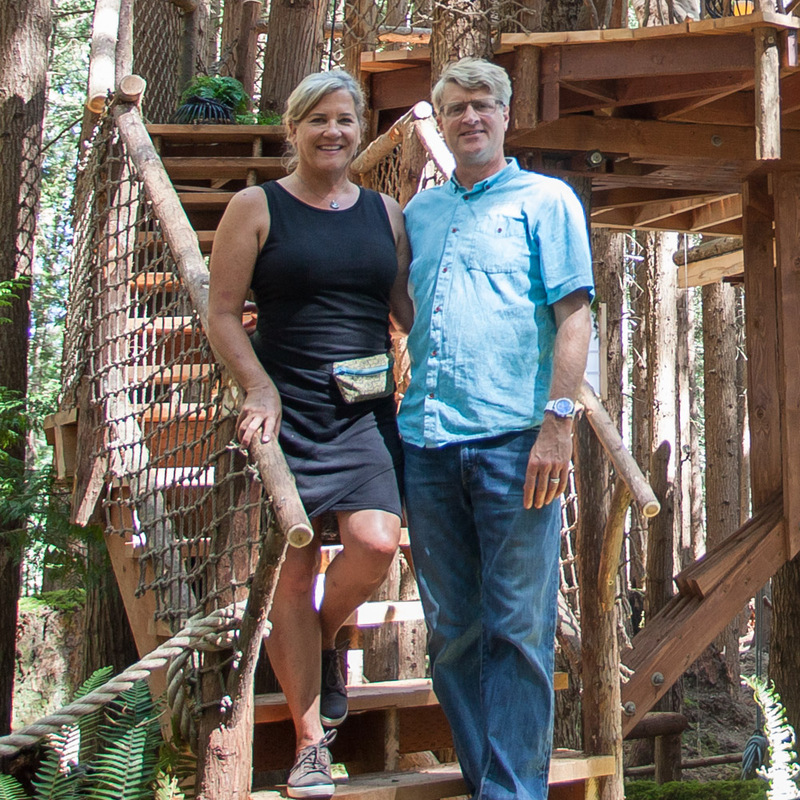 Bun and Frida traversing New frontiers at Treehouse Resort and Spa with Judy and Pete. Chica came home with the Nelsons after their year in Spain. She still prefers to speak Spanish, and rules the house with her regal stature and irresistable, Ewok-like face. Chica adores Pete and is happiest when he is home. Este es mi forma preferida de viajar. (Translation: This is my preferred mode of travel). ToastyBun using her devilishly good looks to distract you from the fact that yes, she was eating that piece of cardboard two seconds ago. ToastyBun was adopted by Emily in 2012 and has quickly risen in the dog ranks because of her blinding cuteness and piercing puppy eyes. Although her age and breed are unknown, she has the heart of a big dog, the bark of a small dog and likes to give quick "love bites" to visitors of the shop. Neko is her role model and together they roam the shop grounds birdwatching and horse wrangling. Bun catching rays with Vic. A girl's got to stay toasty, you know? the only thing we know for sure about this photo is that it definitely wasn't taken by the postman. Here, Bun is showing Garrett how to capture her best side. We all know who the true star of treehouse masters is. Bun doesn't bike to work often, but when she does, she doesn't bike. Toby brings Neko to the our treehouse HQ almost every day. She can be found snoozing on sawdust, testing the strength of wood slabs, and harassing mail delivery workers. Seriously, don't even think about delivering mail unless you're ready for an inundation of Neko barks. Neko can only be tamed with the sweet, sweet taste of dog treats and the soothing sound of Toby lazily reprimanding her from his office. No, Neko is not ironically named after the word for cat in Japanese. Yes, she is one classy mutt. And yes, her favorite trick is tree climbing! Nothing like sleeping on sawdust to make a dog feel like a true shop dog. At last, Neko finds a Place free from the terror of Mail delivery Workers. Rusty (a.k.a. Rustofferson, Trusty-dusty-rusty, Rustafari), was born into the treehouse industry and has been involved in more treehouse builds than most humans could ever hope for. At an early age, he accidentally fell out of a treehouse. He turned out to be fine, but now has a much greater respect for safety. He's the crafty veteran of the treehouse dog crew; he's been there, done that and seen it all. Parents: Pete and Judy. Also parented by Emily and Patrick. Don't be fooled by those big, sad eyes and tiny frame - it's all just a facade for her calculating mind. Frida is the newest addition to the Nelson family! Pete found Frida while building in Texas Hill Country; he has a pattern of falling for dogs on treehouse builds. In fact, Frida is the second Chihuahua Pete has brought home from a job site! Frida is the squirmiest cuddle bug in all the land. She likes to curl up on your lap, in your bed, on your chair—basically, wherever you happen to be—at all times. She sleeps under the covers at the foot of the bed, and enjoys chewing on flip flops and pillows. While occasionally awkward in her movements, Frida can execute some seriously high hops! it's a well-kept secret that frida is the brains behind Pete's work. She likes to sit inside his jacket so that she can whisper decisions to him in between filming takes. it's for this reason they call frida the "TOCTHM," or "The original chihuahua Treehouse Master." Frida caught in a rare moment of authenticity, showing her true evil-genius nature. It takes a one badass cat to be able to hold his own in a shop full of dogs. King Buster doesn't just hold his own: he rules the shop. Fluffier than life and beefier than beef, this cat lives to hunt, roam his kingdom of chickens, and lounge alluringly in front of heaters. His friends call him by his name and his enemies don't call him anything because they are all dead. All hail the King! Buster boasts the mane of a lion. He's also soft in All the right places. A typical Nelson week would not be complete without a call from a neighbor (or friendly stranger from two counties over) regarding Vic's whereabouts. Let's just say she prefers to take herself on walks. Some speculate about the size of her IQ, but that's exactly what Vic wants people to think. By the time you get around to questioning her intelligence, she's already disappeared, living life precisely as she pleases. Damn, Vic's got it all figured out. photo taken in unknown location by unknown person. Frenchy is a grumpy, three-year-old African Pygmy Hedgehog who lives in a tiny teepee. He eats dry cat food and occasional meal worm treats. Frenchy is nocturnal and so he spends most of the day sleeping under blankets, but at night he wakes up and can run miles (no really, miles) on his exercise wheel. When he's scared or extra grumpy he rolls up into a spiky ball. Most people think hedgehogs are related to porcupines but his quills aren't as sharp as a porcupines and they don't detach. He's actually more closely related to a shrew. Because what else would a hedgehog named frenchy live in? Our crew has so many pets that we've moved the rest of this post into a Part II! To stay updated on all things treehouse, subscribe to our mailing list and follow us on social media.